Last week left me in the dust. I think Cheryl still has the challenge open so I'm going to go over and put my U in line. 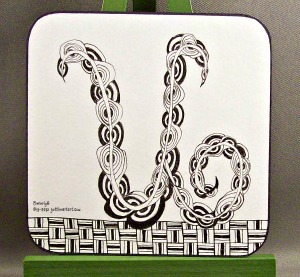 I used the tangle Unyun for the U and sat it on the tangle Up and Across. Tomorrow is V hope I can get that done and entered this week like I'm supposed to. That's the polite way to join in challenges. Bev, I love this tile!! !